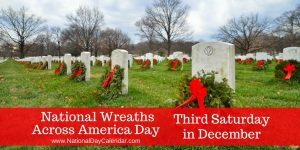 gravesites with a holiday wreath. Over 6,700 wreaths were sponsored for this year’s event. A wreath will also be placed by a CAP cadet on behalf of Merchant Marine veterans. The event will start at 11 AM on Saturday, December 15, 2018, but everyone is encouraged to get there early if possible because parking can take some time. Attendants will be present to guide participants to parking spaces. Bismarck CAP anticipates they will be able to fit everybody inside the cemetery, so parking on Highway 1806 should be avoided unless an attendant directs otherwise. Overflow parking will also be available at Ft. Lincoln like in previous years. Once a ceremony is over, all participants will be given instructions on how the wreath placement part of the event will occur. The current weather forecast calls for reasonable winter weather, but attendees are encouraged to check conditions before leaving home and dress accordingly. The Chapel building at the Veterans Cemetery will be open, but is set aside for those participants who may be especially sensitive to being outside in the cold. Christmas. Shipping is donated by truck companies across the US, with Britton Trucking of Grand Forks making final delivery to North Dakota locations. The WAA program at the ND Vets Cemetery was one of the original 150 sites to participate in this annual event. BismarckCAP30@gmail.com<mailto:BismarckCAP30@gmail.com>. Information can also be found at www.BismarckCAP.com<http://www.BismarckCAP.com>. BISMARCK – The Bismarck Squadron Civil Air Patrol will facilitate this year’sWreaths Across America event at the ND Veterans Cemetery on December 15th starting at 11am, with the help of the community. The event will occur simultaneously withover 1,500 other ceremonies at locations in the United States and beyond, and willbe highlighted by the placement of military service ceremonial wreaths by veteransof each respective service. The ceremonial wreath presenters were nominated by thecommunity, and selected via a random drawing. The event will culminate with adorninggravesites with a holiday wreath. Over 6,700 wreaths were sponsored for this year’sevent. Bismarck (CSi) The Bismarck Squadron Civil Air Patrol will facilitate this year’s Wreaths Across America event at the North Dakota Veterans Cemetery on Dec. 15 starting at 11 a.m. The event will culminate with adorning all gravesites – over 6,600 – with a holiday wreath. The event will occur simultaneously with over 1,000 other ceremonies at locations in the United States and beyond, and will be highlighted by the placement of military service ceremonial wreaths by veterans of each respective service. CAP is seeking nominations from the community for veterans from each service to place these ceremonial wreaths as part of the WAA event program.